I make! Beer can chicken edition | Random moosages as I see fit. I have been embarking on this journey in which I try and use all the food that’s been stored in my freezer, fridge, or cupboard. This past weekend, I used up this can of beer that’s been in the fridge for who knows how long, a chicken (fryer) that’s been in the freezer for who knows how long (actually, I think I have an idea of how long), and a bunch of green onions that’s been mouldering away in the crisper drawer (they weren’t moldy, but they were starting to wilt). I also used up two cans of peaches, but that’s another post. Anyway, I think I was rather successful in my battle with the overstuffed fridge this past weekend. I’m terribly proud of myself. Terribly. 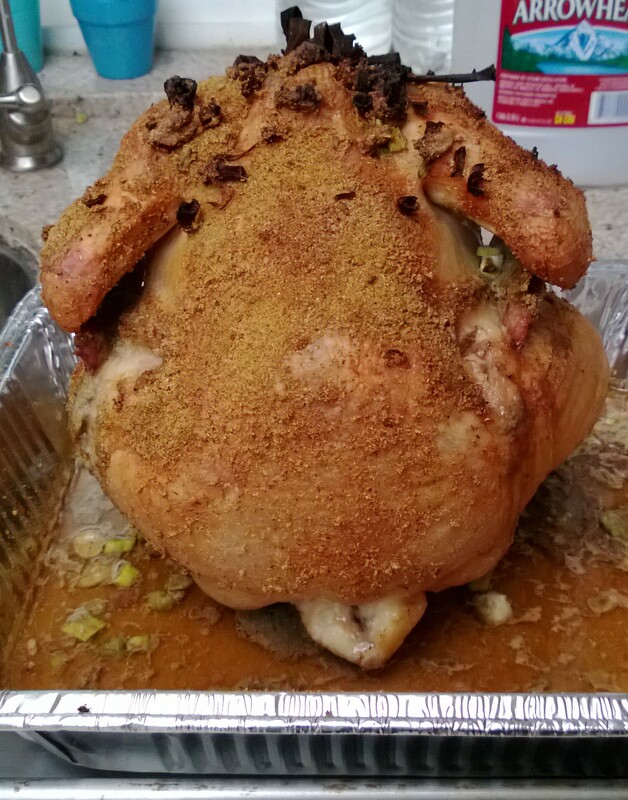 So anyway, with these ingredients and some other things that I can normally find in my kitchen, I was able to make a…BEER CAN CHICKEN! It’s a roast chicken utilizing beer to keep things moist. I more or less followed this recipe. I omitted the powdered onion because I didn’t have any and the extra salt because I thought the season salt was enough. Also, WTH? A TABLESPOON of salt? Blech. That has to be a typo. Also, the recipe is kind of confusing because the directions seem to refer to two different cans of beer but only says that you need one can. I only used one. I poured about half into the pan and the other half was in the chicken steaming away during cooking. I did check halfway through cooking to see if I needed more liquid on the bottom of the pan. It was ok. Also, next time I think I’ll try and stick the dry rub under the skin of the chicken. I don’t always eat the skin of the chicken and if you don’t following the recipe I linked above, the chicken doesn’t have a whole lot of flavor. Now then, what did I do with all this chicken? Well, it’s going to feed Yaris for six days (she gets a mix of fresh food with her kibble). It’ll feed me for two because with one half of the chicken breast and some of the thigh meat and a bit of the skin, I made enough basil chicken salad for two meals. I was trying to figure out what to do with the chicken and I opted for a basil chicken salad partly because my basil is going crazy and putting out leaves all over the place and has over doubled in size. I’m going to have to make pesto or something soon. Also, basil and chicken go together well. The chicken salad had a mayo and plain yogurt base (I don’t like using all mayo when making stuff), about a cup of basil, two cloves of garlic, three packets of parmesan and two packets of red pepper flakes from zpizza, and salt and pepper to taste. I blended all that together and dumped the chicken in (chopped of course) and mixed everything together. Tada! Basil chicken salad. So, that takes care of all the meat. With the bones, giblets, skin, and remaining beer in the can, I’m making chicken stock. It’s still simmering down as I’m typing this. It smells really good. Along with the chicken carcass, I tossed in some furry carrots (as in they were sprouting and there were root hairs everywhere, not as in moldy, also I peeled them so they were fine). The I’m depending on the spice rub on the skin of the chicken to season the stock so it worked out that all the seasoning was on the skin this time. So, three things done with chicken! Yaris will probably be the main beneficiary of all this chicken cooking! Tada! Life is Short. Eat Hard!